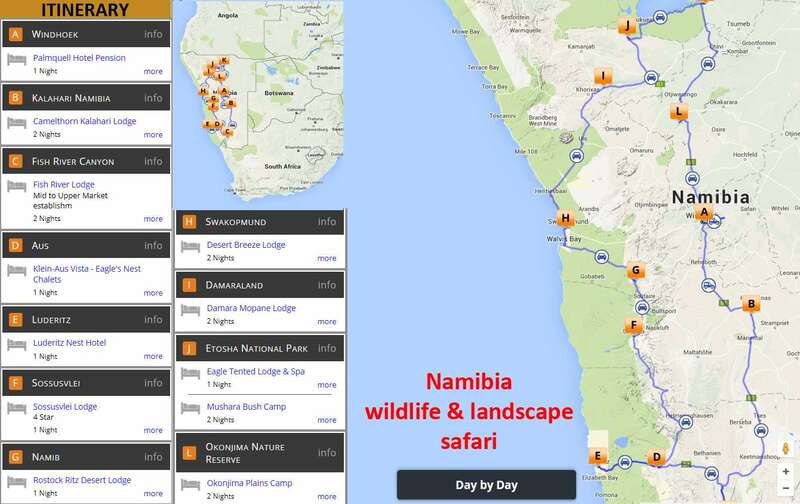 From 2nd – 22nd November 2015 we’re driving throughout Namibia in a 4×4 trying to cover as much of the country as possible in the three weeks we’ve allowed ourselves. 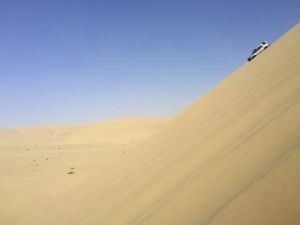 The journey promises to be a fascinating mix of dramatic desert landscapes, wonderful wildlife encounters and luxury lodge layovers if all goes according to plan. We’re flying both ways with Virgin to Johannesburg; they told us we’d be flying in the very newest of their fleet – the Boeing 787-9 ‘Dreamliner’ – bringing new levels of comfort, air quality and entertainment to all its passengers – as well as being far more fuel efficient and quieter than previous generation aircraft by virtue of its high percentage of carbon fibre composites in the construction of wings and other components. We’ve commented on whether we thought the performance lived up to the promise. Our plan is to follow the route you can see on the map below. 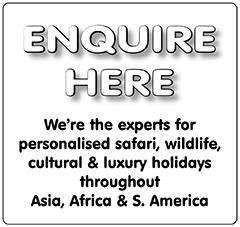 Having prearranged luxury lodges and camps on the route it was just down to us when we pitch up at them. 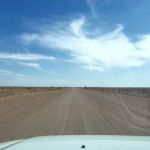 It’s a fascinating journey and we’ve posted a report day-by day, or as we have internet access. Our team at home will work with us to try and keep you posted on Facebook and Twitter as to our progress. 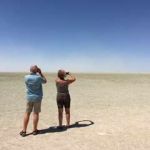 We’re hoping that by covering north, south, east and west of the country that we’ll have a good impression and understanding of what Namibia has to offer in order to bring you up to speed if you’re thinking of going there. An unfortunate and avoidable overbooking by Virgin meant that six Premium Class passengers were offered flights to anywhere gratis in exchange for enduring Economy to Johannesburg. The Virgin groundstaff were displeased at having to field the policy decisions of their management in overbooking by so many on a relatively small cabin. As a tip for the future – if you can’t download your boarding pass online the night before its an indication that the flight is overbooked and you need to get to the airport to secure your seat; more than the three hours in advance that we’d allowed! As a result the Dreamliner wasn’t such a dream, the flight was turbulent as the South African Airways flight dead ahead of us had secured a height two thousand feet above us and the cloud tops we were scudding through, which postponed drink and meal service, the aircraft was already showing signs of wear and tear (tray tables that sloped your meal into your lap, toilet seats with bits missing, inflight entertainment that stopped every three minutes etc) but to be fair we don’t lay all of this at Virgin’s door as Boeing and ATC must take some responsibility. The plastic plane, the Dreamliner is undoubtedly quieter than its predecessors and with its electronically tinted dimming windows and other gizmos showing the way ahead. Economy however was little more than subtly refined discomfort! 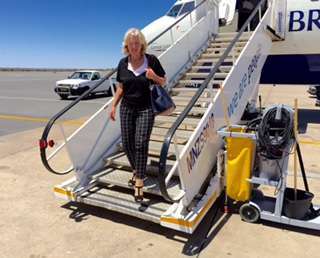 By the time we arrived in Windhoek, after a two hour wait and another two hour flight with BA in an ageing 737 from Jo’burg (in seats that were frankly more comfortable for dozing than the new Dreamliner ones) we were definitely jaded by the 20hrs travel door-to-door. Feeling ready to fall into a pool, or gin and tonic, whichever came first we were met by our ground agent who proceeded to give us a two hour briefing on our forthcoming tour! 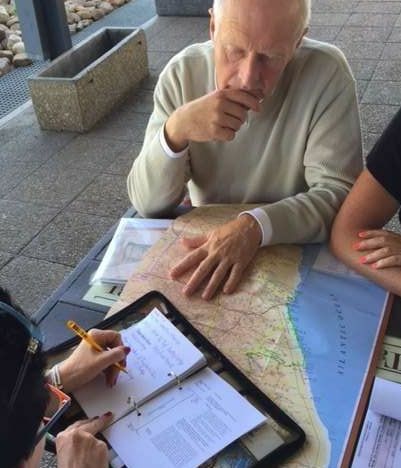 The briefing was fantastic but it seemed as exhausting as our three week tour might prove to be. 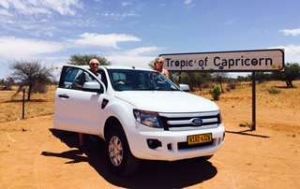 Having subsequently taken delivery of and checked out our brand new 4×4 Ford ‘D’ cab Ranger from Europcar – which seems to be the 4×4 of choice in country, we left the airport on autopilot. 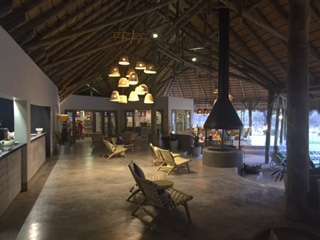 Thankfully, we’d booked an unremarkable lodge for our first night in Windhoek and just 30kms from the airport. The Palmquell Pension Hotel is a clean, hospitable establishment which offers little more than a reliable stopover for the exhausted traveller. Thinking it unwise to go straight to bed as it was only 6pm we asked for a recommendation for dining close-by and were rewarded by a lovely courtyard restaurant, The Stellenbosch, which although in a new development nevertheless has all the feel of colonial heritage. The ‘maître d’, David, was most accommodating and attentive, making the evening that much more pleasurable. We didn’t scrimp, starting with a couple of G&T’s and managing to eat the best filet on the menu with nice wine to accompany it – all for the princely sum of about £15 per head. 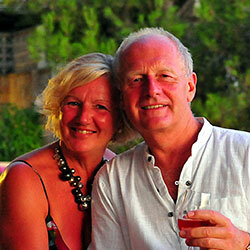 Its surprising what we can manage through exhaustion when food and drink is involved! A 9am departure and short stop at a Mall for some provisions and we were on the road to the Kalahari by 10am. 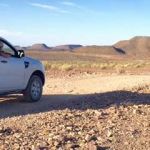 We took it in turns at driving in order to familiarise ourselves with the rather sloppy gearbox and handling characteristics of the otherwise very comfortable Ford. Within an hour we had crossed the Tropic of Capricorn and were on our way south, After about 100kms the metalled road (that ran straight as a die to the horizon through sparse bush and scrub that stretched as far as the eye could see in any direction) turned into shale and gravel with an overlay of windblown sand and our speed dropped to about 50mph (80kph) tops, as the 4×4 wandered around on the loose surface. 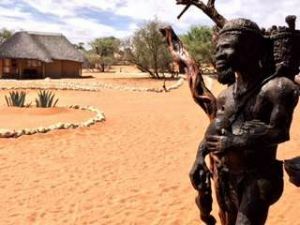 On entering the Intu Africa Kalahari Private Reserve after another 80kms, the gravel road turned into sand tracks and engaging 4×4 drive made easy work of the rest or the journey to Camelthorn Lodge. A welcoming apple juice and cold towel made the arrival all the sweeter and although we’ve done our share of roughing it in jeeps and tents, there can be little substitute for being shown into air conditioned luxury cottage after a dusty drive. 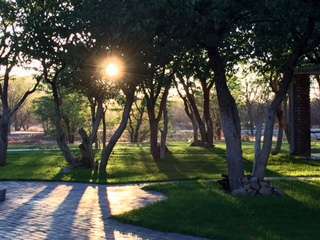 We’ve just chilled for the rest of the day with a cold beer in hand and the prospect of a walk into the desert to watch the sunset – unhindered by light or noise pollution to spoil the effect. 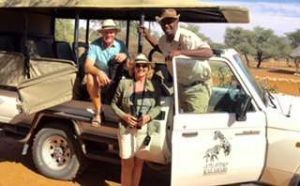 A 6am start and light breakfast sees us leaving camp in a safari jeep to tour the Kalahari private reserve. Of as much interest as the wildlife are the gently rolling dunes of red Kalahari sand separating the larger flat lands of Acacia-strewn scrub in between. 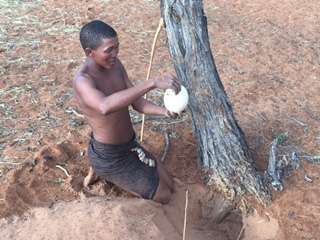 We spend about two and a half hours enjoying the well distributed Oryx, Springbok, Steenbok and Ostrich; including seeing numerous abandoned Ostrich eggs and a lone male incubating his own mate’s. 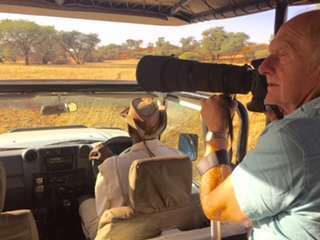 We’d elected to use a safari specific vehicle rather than our own fully enclosed 4×4 to improve the chances of wildlife spotting and photography. 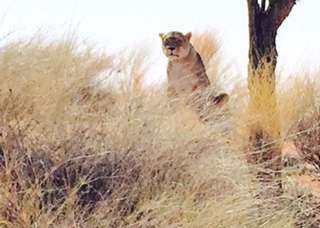 A lone lioness is the remnant of an old captive programme that is no longer permitted under Namib law and the ageing 17yr old was an interesting, albeit unnatural and sad sight as her male and female companions have long since died. Returning to camp we found the appetite for another breakfast top-up followed by a relaxing doze by the camp pool and lunchtime cold Windhoek beer. 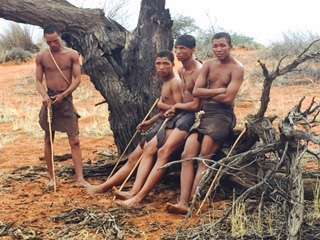 As we write this we’re waiting for the San tribesmen to arrive to take us on an evening bushwalk to explain their ancient practices for survival. Its been a quiet but interesting day – a welcome break to acclimatise – before we head off south again for a five and a half hour drive to Fish River Canyon (apparently the second largest on earth) tomorrow morning. 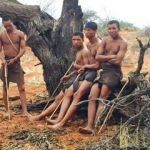 The San tribesmen provided a highly amusing insight into their ancient way of life and survival practices, utilising a highly theatrical mime routine that had us laughing at their antics as they vied to outdo one another for effect. Very much a tourist cameo, it nevertheless provided a light-hearted snapshot of marginalised life. The sky darkened to deep purple and a short shower of heavy rain drops failed to dampen our spirits or the thirty degree heat as we enjoyed a sun-downer on the dunes before returning to camp. 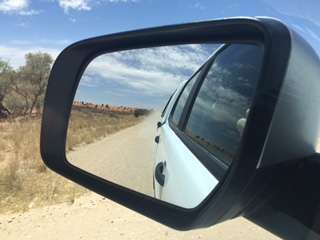 Leaving Camelthorn by 9.30am this morning we headed south to the B1 and Mariental; passing along the foot of the sandstone escarpment of the Weissrand with a view of flat featureless desert that simply disappeared into forever in every direction. 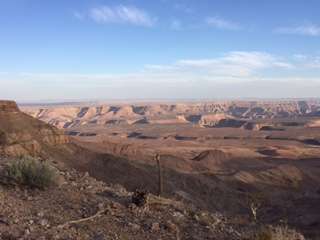 We drove through this landscape for hours before reaching Keetmanshoop and turned off for the Quiver Tree forest. 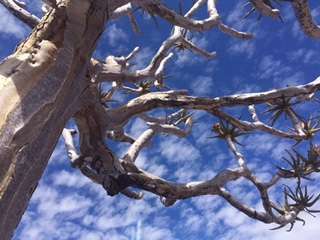 These skeletal trees with hard polished bark and sprouts of greenery at the twisted branch extreme ends were often used by bush people to make arrow quivers from their branches – hence the name. They appear to grow from the most inhospitable rocky ground and are dotted at random places around the landscape, which simply accentuates its barren nature. 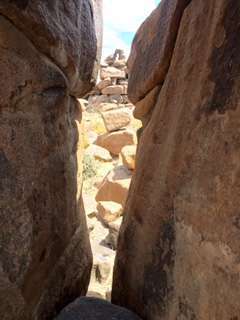 Nearby is the Giant’s Playground – a vast rocky landscape littered with improbably stacked boulders of all shapes and sizes; as if a giant had been playing with his building bricks. Known locally as Vratteweld it is in a fact the eroded elements of molten lava that erupted over 180 million years ago. 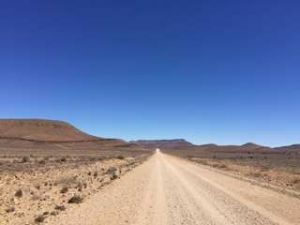 Driving on again, after stopping briefly for provisions near Seeheim we continued on a seemingly endless straight road to the horizon until finally turning off the B4 onto the D463 for Fish River Canyon and our next stop at the Fish River Lodge. 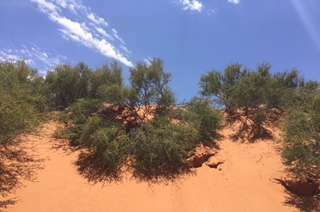 The road over the next hour and a half and twenty kilometres deteriorated from wide gravel expanses to narrow rocky tracks through a landscape reminiscent of the wide Mesa strewn valleys of the American Wild West. 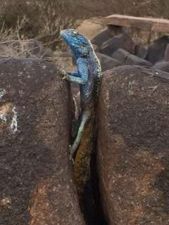 Our steady pace enabled us to spot Zebra, Springbok and Kudu in a rock smothered landscape that seemed barely able to support the thorn bushes and scrub that littered it. Arrival at the lodge just before sunset, we were greeted warmly by Marco the manager and ushered towards the reception area. Marco must be used to welcoming all sorts of characters who have endured the far from comfortable ride to the lodge but the view that awaits as you step through the entrance door must silence even the most vociferous or disgruntled visitor – its simply stunning. 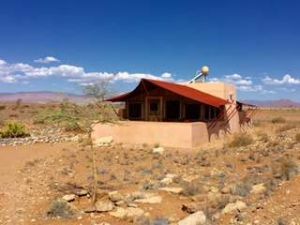 The Lodge clings, as the staff T-shirts state, to the ‘edge of eternity’ and it hardly seems like exaggeration as the building sits on the very rim of the huge expanse of canyon before you. Distracted and anxious to immediately take photos in the beautiful evening light, we were eventually brought back to our welcome briefing and handed our ‘survival kit’ of ear plugs (for the wind noise), torch, air alarm (for emergencies) and plug adapter. We were told of the options available as activities for our stay but the offer of a seven hour round trip jeep ride to the base of the canyon at 7am the following morning held little appeal after our already full day in the car. The night was indeed very windy but the rooms and beds were comfortable and gave little impression we’d be swept from the canyon rim. This in part is due to the fact that the twenty rooms that spread along the rim on either side of the main Lodge look like military gun emplacements at first glance, rather than rooms. Inside they’re minimalist, clean and well thought out, with showers inside and out but sensibly maximising on the breath-taking view through wall-wide windows at the front. The architecture is almost brutalist throughout but its not until we walked for nearly an hour to a promontory at one side of the canyon that the clever integration of the lodge and its rooms falls into place, as it cleverly mirrors the rough hewn rock strata of the canyon sides beneath. This was enough activity for one day and a chilled beer was calling us from across the canyon, where we settled into a chilled out state for the remainder of our stay. It would be easy for Fish River Lodge to become complacent about their service and presentation with such a mesmerising vista in front of them that on its own makes the visit worthwhile. They haven’t. Throughout our stay the standard of meals, the staff’s friendliness and their wonderful African singing in the evening have made us feel truly welcome. 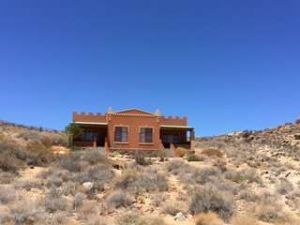 The rather austere look to the buildings and open spaces within not only complement the barren landscape but also provide a very flexible space within which to sit at the bar pre-dinner, at table for dinner and around the fire post dinner with sufficient space to be alone if you wish without ever feeling isolated from your fellow guests. If we have any criticism at all its that the briefing should include mention of the bucket provided in our room to save water as the shower warms and the fact that hot water is available to the door in the early morning for tea as no kettle is provided – nit picking really but resources are scarce in Namibia, and especially here so every little helps. 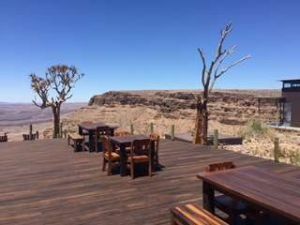 When all is said and done, however, if you ever find yourself in Fish River Canyon, make sure you find your way to Fish River Lodge – you certainly won’t forget it! Leaving Fish River Lodge by 8am after a pleasant breakfast of fresh fruit and freshly prepared omelette it was nevertheless another hour and a half before we left the broken rocky track that weaves through the Canyon National Park and regained the more graded gravel road that is the D436. Nevertheless these superbly prepared gravel strips that lead us through the Hunsberg still present the occasional jolt as the loose surface grabs the steering at inopportune moments and sends us off course. Three hours later we crest a rise and see the Namib Desert stretching for miles ahead and on either side; reminding us that humans are vulnerable and insignificant in such vast landscapes. We briefly booked into a lodge for the night – nothing special but more than adequate; the Klein Aus Vista property is hardly luxury but more a welcome place of convenience, as we wish to explore part of the desert, in particular where we can find the wild horses of Namib. 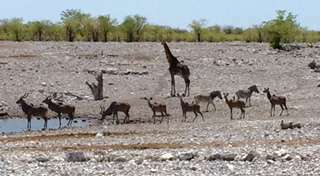 We eventually find the horses – a herd of about fifty – set in a wide expanse of barren and parched land. Some are in calf, some with new-born calves, other young stallions fancying their chances. 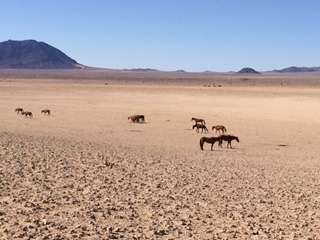 Originating either from cavalry horses that scattered during the first World War or from a ranch that ran into bankruptcy, there now averages about one hundred wild horses in the Namib. 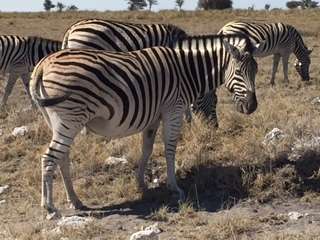 Their numbers vary according to water and food availability – we were amazed there were any given the poor nature of grazing. These horses have adapted to the harsh environment by cutting their need for water to once every 72hrs – we can’t even last 2hrs, as dehydration is the thing we have to be constantly watchful of; attempting to drink over three litres of water a day each. 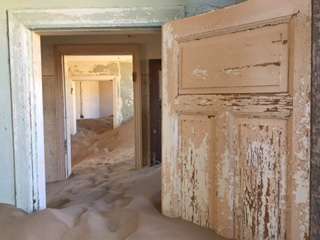 Tomorrow we’re off to the Ghost Town near Luderitz where a once thriving mining operation was abandoned leaving only skeletal remains of the buildings and workings submerged by windblown sand. Tomorrow afternoon we’ll visit and stay within Luderitz itself. What was an early start turned into a shambles as we drove for 40kms before realising that the nearest fuel station was ten kilometres further ahead than we had fuel for! We added another hour and a half to our journey time by returning to Aus for fuel before turning around yet again to head for Luderitz. The detour, nevertheless, had to be better than being stuck in the Namib desert without fuel – so we still managed to keep a smile on our faces. 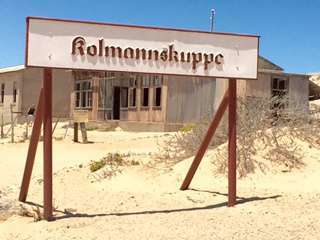 We arrived at Kolmannskuppe by the skin of our teeth in order to get in by the 11am deadline as access to the De Beers ghost town is restricted to certain times. 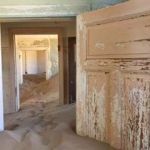 Abandoned eventually in 1956, the town had lost its sparkle long before that with the discovery of a better vein of diamonds further south in the 1920s – the town being left to the wind and sand with the final departure of its resident doctor. 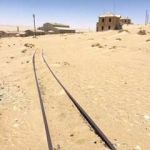 Since then it has gradually fallen into disrepair and continues to be reclaimed by the desert. 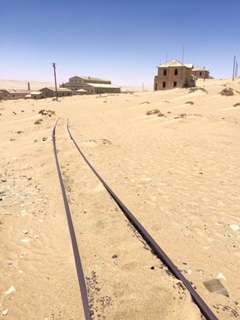 Leaving the gradually submerging ruins we punched our way through the drifting wind-whipped sands that skudded across the road we were taking to Luderitz. 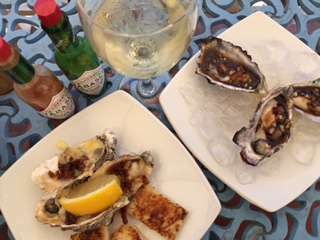 Feeling decidedly sand blasted we were pleased to book into the Nest Hotel on the sea front and immediately found our way to the restaurant for cold beers and a snack of fresh oysters. Walking into town afterwards we were again struck by the ferocity of the wind that seems to be a constant companion so far in Namibia. 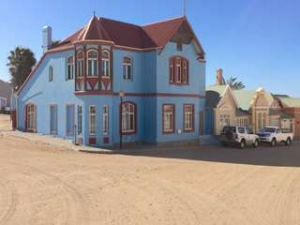 Luderitz itself is a small town that really only owes its existence to its industrial past, evidence of which still prevails amidst the Art Deco stylised architecture of the inter-war years. 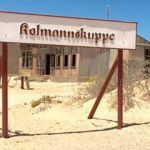 In our opinion, neither Kolmanskuppe nor Luderitz are worth a major expedition to find but fit well as an attraction within our circular Namibian ‘grand tour’. 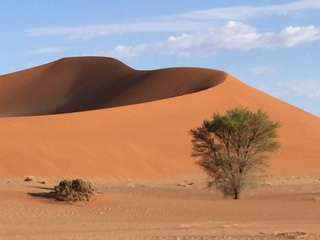 Tomorrow we’ve a seven hour journey to get us to Sossusvlei for the start of the second week of our journey. 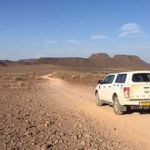 Not much can be said about the 8hr drive to Sossusvlei from Luderitz other than it was hot, very hot – and took us through some stunning scenery with huge big sky, open wall-to-wall vistas of rolling hills and sand of the Namib Desert. Booking into Sossusvlei Lodge was a huge relief and after consuming copious quantities of water en route, our first stop was the bar for a long cold beer. 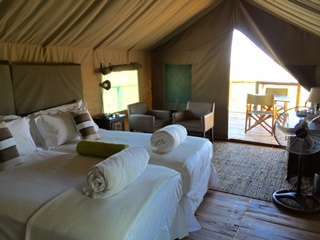 Our accommodation was in quasi tented luxury lodges which after you subtract the purpose built shower block and dwarf walls for each lodge leave very little canvas to qualify as a tent. Nevertheless the rooms were air conditioned, comfortable and all too little used, as immediately after dinner we retired to bed in anticipation of the 4.30am alarm call! Waiting at the park gates by 6am after a hasty breakfast we were soon travelling down the 67km strip of tarmac (a very welcome change from the gravel and sand highways) that leads from Sestriem (where Sossusvlei Lodge is) to the mountainous Sossusvlei dunes. 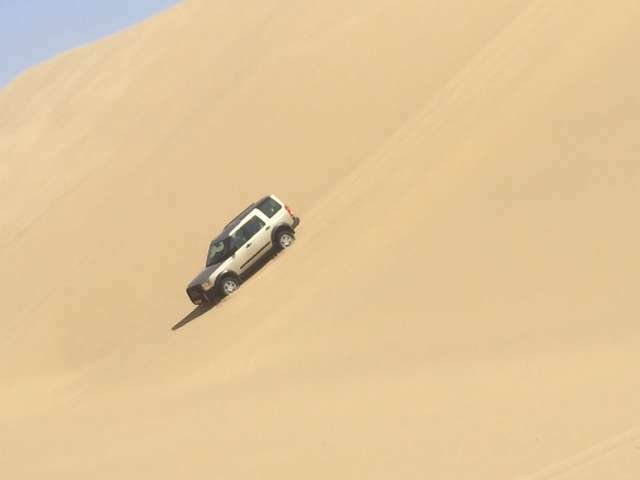 The last 5kms is over very deep and loose sand so our 4×4 put in a stirling effort as we put it through its paces. 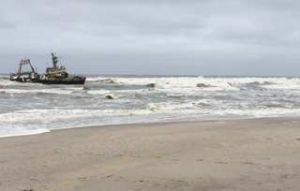 Some were not so lucky as us, having to abandon their vehicles as they became beached and immovable. We bypassed Dune 45 which has a beautifully defined ‘leading edge’ where the wind has sculpted sweeping curves into it, as if it were ice cream; many people were already climbing it – putting teeth-like serrated edges into natures craftwork. 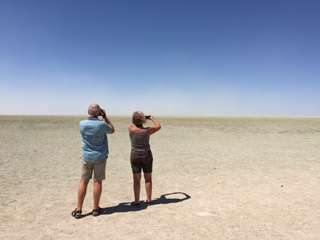 We wanted to reach ‘Deadvlei’ a salt pan at the end of the track before the heat of the day set in. Unsure of which way to go we ended up climbing the edge of the highest dune (about 150ft/50mtrs) high, where the navigable edge was no wider than our two feet – an exhilarating climb. As we neared the top we could see Deadvlei beneath us and realised that we’d need to surf down the side of the dune to reach it – its the first time we’ve been barefoot skiing in sand! 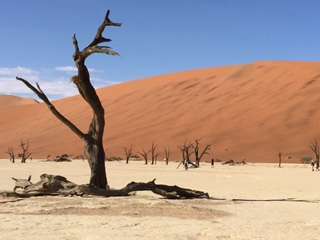 Deadvlei is quite surreal as its a ‘dead pan’ of salt encased within surrounding dunes and littered with the skeletons of trees that give it an eerie atmosphere – if it wasn’t for the fifty or more people trying to capture their own special shot of dead trees, salt and sand without another person getting in the way! 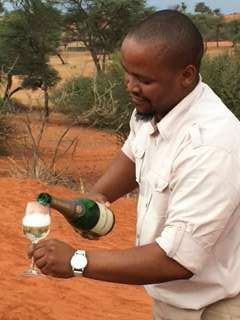 We returned to Sossusvlei Lodge for as freshen up after eating a welcome snack under the shade of an Acacia tree near the sand road out – watching with some consternation at the harsh way people were treating their vehicles to muscle them through the sand with brute force – when what it really needs is finesse and patience. The drive from Sestriem towards Swarkopmund was a relatively easy couple of hours before we stopped at Solitaire for fuel (we remembered this time) and home made apple pie! Its a speciality of this one horse town’s filling station and they sell about two hundred healthy sized portions each day. 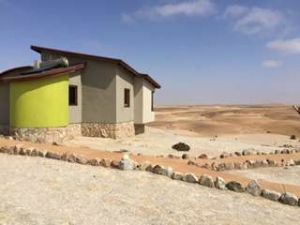 The last 50kms to the improbably named Rostock Ritz, igloo dwellings on the way to Swarkopmund, soon disappeared and we turned onto the property accompanied by the sight of Zebra grazing and Meerkats in the rocks adjacent to the main building. A shower, swim, another shower and we’re looking forward to our first G&T. Needless to say, the trek didn’t happen and we spent a very comfortable time at Rostock Ritz – a testament to what someone with a vision can achieve, however misguided it might seem to the outsider. Wolfgang, the owner has literally carved his legacy into the mountains and built a resort in the middle of nowhere – more of that another time. 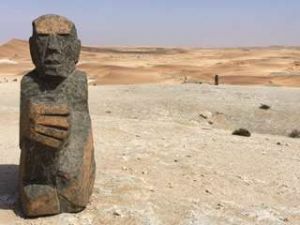 Our journey today is a relatively short one, through the Namib Naukluft Park, which varies from narrow gravel roads that wind through gorges and ravines of black stone, to wide featureless wastes that seem to endure forever. 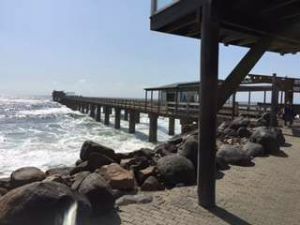 Our arrival in Swakopmund after about three hours is a welcome sight, especially as we’ve been skirting the Atlantic coast from Walvis Bay northwards, which surprisingly is encased in an eerie fog. 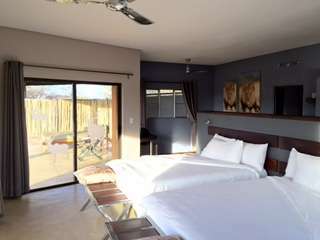 Our next two nights are spent at Desert Breeze, a very modern and brilliantly executed collection of individual bungalows that have been constructed with every attention to detail, including superb, ever-changing views of the desert we had so recently left behind. Ever-changing because of the passage of the sun and the patterns and shades it creates in this rolling sea of sand. 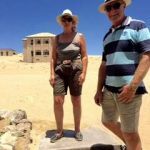 We were surprised to be asked if we’d like the fire lit in our Bungalow and even more surprised to see that the rooms had neither a/c nor fans – apparently the temperature is much more continental here than desert-like. 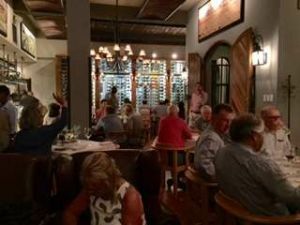 There is no dinner on offer at the Desert Breeze so we went into town and were disappointed with the evening at Kuki’s – a semi-fast bistro food that was anything but fast. Still, we’ve been recommended another restaurant for tomorrow. 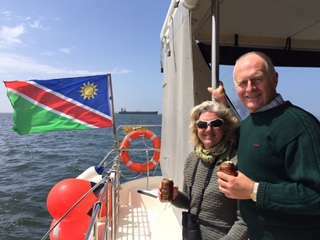 Rising early and after a good breakfast we return to Walvis Bay in order to catch a catamaran for a trip out to the seal colony on one of the outer points of the bay. Various oil ships use Walvis Bay as a cheap parking lot from their endeavours in Angola – until the oil prices recover – so the bay is quite populated with all sorts of oil survey vessels and new rigs. The area is also a thriving oyster fishery but we were here to see the seals and as a bonus had numerous pelicans landing on board and bottle-nosed dolphins swimming alongside. Strangely, frequently seen with a drink in hand! After our foray into the bay we return to shore to drive along both it and deep into the area skirting Sandwich Bay. This was an off-road experience to eclipse anything we thought we might be capable of ourselves. Even though we’ve owned 4×4 vehicles ourselves and travelled off-road on numerous occasions, including various hands-on experience days – none of it compared with sliding down mountainous 45degree slopes, climbing impossibly steep dunes and traversing cascading slides of sand that the driver put our vehicle through with a backdrop of blue sky and crashing Atlantic waves – a really good lesson in how to control a car in extreme conditions. 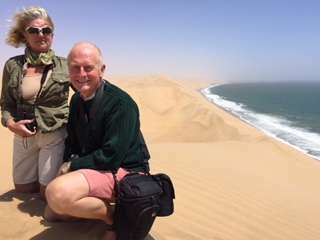 We stopped somewhere in the middle of these dunes, met a number of other vehicles and enjoyed a picnic of fresh oysters, canapés and sparkling wine. We’re now back at Desert Breeze feeling thoroughly exhausted, in the most pleasant of ways and preparing to go out shortly to the restaurant we’ve been recommended by the old iron pier in Swakopmund – more tomorrow. 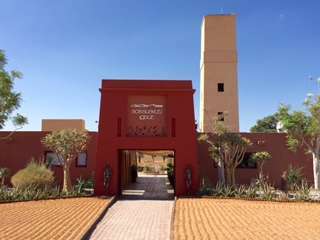 We were in the car by 8am bidding a reluctant farewell to Desert Breeze with its faultless cleanliness, finishing touches and overall well thought out design and presentation – one of the most relaxing and stylish we’ve stayed at in Namibia. Dinner the previous evening at ‘The Tug’ was a delight; the staff friendly and very helpful; the meal a pleasure with a menu of predominantly seafood. The place itself is modelled on part of an old tug that plied the seas around Swakopmund and the bulkheads, checkerplates and doorways add to the buzzy ambience of this highly popular restaurant. 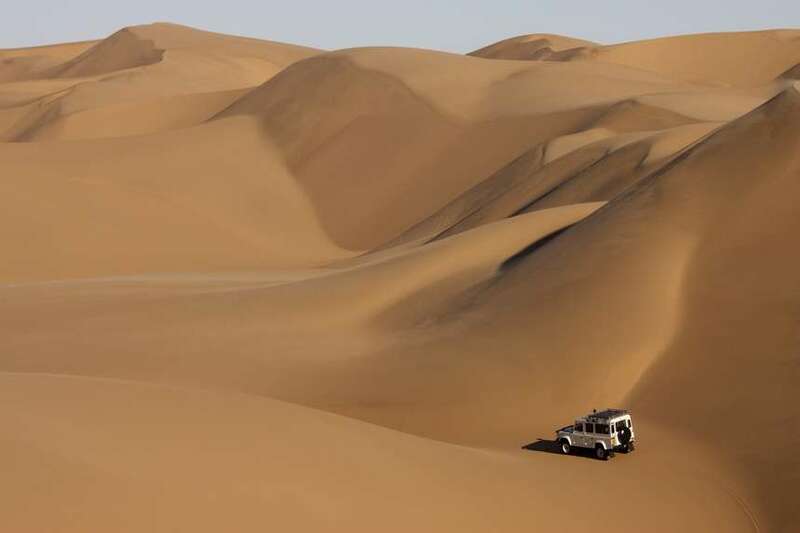 Heading northwards along the coast we soon left the towering dunes of the Namib and Dorob National Park behind to be replaced by the flat expanses of sand and magnetite dusting that heads towards the Skeleton Coast National Park. 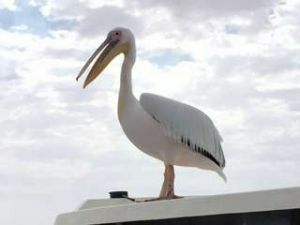 There are numerous recreational areas along the coast dedicated to sport fishing – almost an endemic pastime in this area. 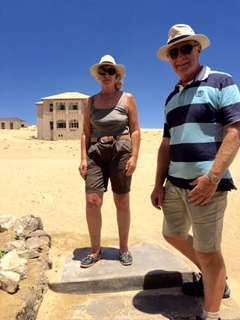 We took a short detour to Cape Cross, site of the first white man’s step into South Africa. 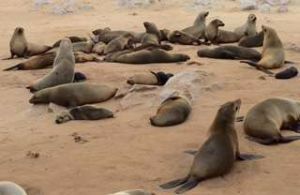 Here the Portuguese erected a cross, a replica of which sands today; now more of a marker for the huge Seal colony that takes your breath away – from the smell of their waste! Technically most of the Namibian coast is regarded as Skeleton Coast after it was coined as a phrase by a reporter writing about the disappearance and likelihood of finding the bones of a Swiss flyer, Carl Nauer, in 1933. 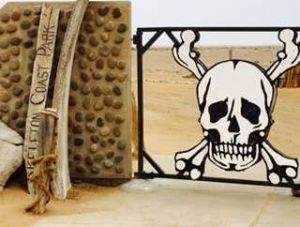 Nevertheless its the northernmost coastline that is named as Skeleton Coast National Park into which we signed for our permit and passed through the dramatic ‘skull and crossbones’ gates into the open wastes along the shoreline. There are numerous wrecks along the shore that remain as testament to the treacherous waters of the Benguela current that conspired with the storms and fogs of the area to make this stretch of coastline one of the most feared in maritime folklore. Wrecking your ship here meant almost certain death as the inhospitable hinterland offered little by way of shelter or water. The wrecks are haunting reminders of this history with ships wrecked as recently as 1975 and still largely intact, whilst others are simply skeletal remains of decades and disasters past. Access to these wrecks can itself be hazardous with 4×4 travel along the strand subject to shifting sand of various degrees of depth and consistency. Frequently not seeing another vehicle for an hour at a time and in areas on the beach where no vehicle might appear for days, you have to be sure of both your vehicle and your ability before venturing too far. This is truly a bleak and unwelcoming area and with a deeply overcast sky, whilst we were there, gave a glimpse of how one might abandon hope if wrecked here. Driving the Skelton Coast had been a long held but inexplicable ambition, this area being one of the most infamous in the world and it was with some great pleasure that we fulfilled this aspect of our journey through Namibia. 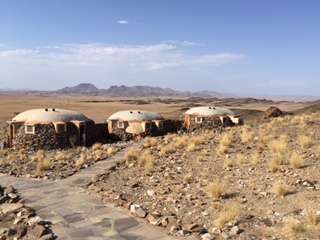 Turning inland we headed for Damaraland through the table-top mountains and the wide open expanses of rolling foothills. It was at this point that Cherrie, who was driving at the time, noticed that the steering had acquired a pull to one side and, sure enough, we had a puncture. Fortunately we’d prepared for this trip by carrying two spares but before we could even get out of the car were surrounded by kids from the collection of nearby huts. As we attempted to locate the jack, remove our flat and replace it with the spare, no less than eight kids took over and acted as a pit crew. 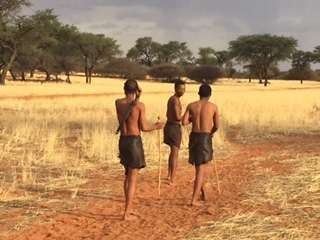 As this was our first real encounter with local people in the ‘wilderness’ we were unsure of whether we’d lose our wheel nuts, if not the wheels amidst the frenzied activity taking place around our ankles. However, they were clearly polished at this routine and achieved the change in half the time that we could have – including laying in the dirt under the car to retrieve the spare slung beneath it. 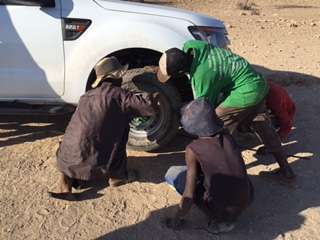 With me taking care to position the jack correctly and count the wheel nuts, the rest of the job was accomplished faultlessly by our pit crew; rewarded by a few Namibian dollars. Within a couple of kilometres we were able to get a repair done by a roadside shack (in case we collected another puncture which would leave us out of spares), where the owner took great delight in extolling the virtues of Arsenal football club and their rivals Lose-a-pool, as he called Liverpool! After some cheerful banter and payment of 100 Namibian dollars (£5/$7 approx.) 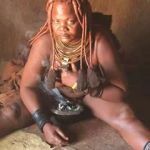 we were again on our way to the next overnight halt at Damara Mopane Lodge. It was with some relief that we finally sat at the bar with a G&T after an 11hr day in the car; reflecting on the fact that had we suffered a puncture on the Skeleton Coast, our G&T might have been considerably delayed. 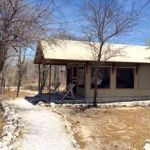 Damara Mopane Lodge is a ‘village’ of over fifty bungalows laid out as a neat community and would seem more suited to groups. That said, the layout of the village is clever in that, even in the restaurant and common parts, one never feels surrounded by people. 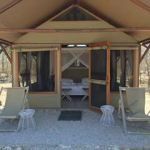 Food quality is good, the pool inviting, plenty of shade and grassy areas (a real novelty in Namibia) and the whole is only compromised in our opinion by the ‘third world office’ décor of the bungalows themselves. Basic wooden furniture, colour-washed walls and unimaginative presentation, whilst authentic African, nevertheless undermines what for the most part is a well presented location. The option to visit the Petrified Forest, World Heritage site rock paintings and Burnt Mountain has sadly but not reluctantly been usurped by the appeal of a day of rest by the pool. We might venture out on a trek as the sun loses its 45degree midday heat. 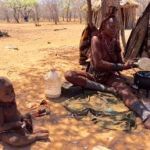 With an early morning breakfast at 6.30am we were soon on the road for what could have been a simple two hour drive but which we doubled to detour via the Himba village to the north. 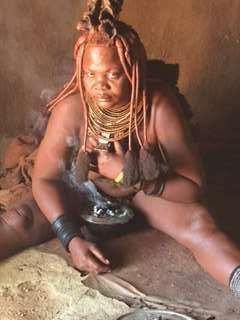 Set up to shelter orphans the Himba still practice the same rudimentary way of life within their mud huts. 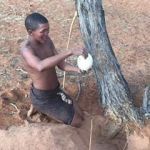 A fascinating insight into hunter/gatherer living which has now been contained, we were captivated by their customs and dress but ever conscious of our own privileges of luxury by comparison. 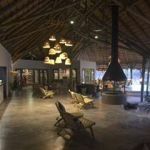 Arriving eventually at Eagle Tented Lodge we were struck again by our good fortune as we booked into our luxury tent within a lodge complex that owes its architecture more to a Bavarian castle than to an African landscape. 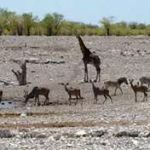 We’d get precious little time to enjoy the pool and restaurant – both of which were great – as we were planning a silly-o’clock start at 5.00am the following morning to make the most of Etosha National Park. Dawn to dusk over a twelve hour drive and we saw more wildlife in greater numbers than at any game park before. Given that we’ve lived and worked in India’s jungles this was amazing. Whether because we were in the park for such a protracted period, or because we were lucky with our sightings – who knows? 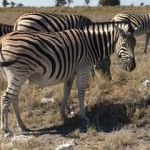 Nevertheless we saw elephant, zebra, giraffe, kudu, springbok, impala, dik-dik, steenbok, eagles, vultures, jackals, lions and all in numbers greater – and in close proximity to one another – than we could have reasonably expected. 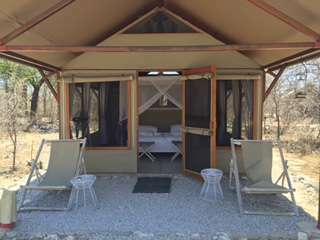 Etosha needs a blog of its own so suffice to say it was a wonderful experience – no more so than checking into Mushara Bush Camp and a very welcome safe-arrival beer before dinner and to bed in our luxury tent – before yet another early call for tomorrows bush round by private open vehicle. Stunning – a cheetah mother and her two, three-month old cubs, together with just us, in the wild for fifteen minutes before other jeeps arrived. A wonderful scene then destroyed by the arrival of unthinking visitors who simply ploughed through our waiting vehicles in their own, screeched to a halt in a cloud of dust, departed as quickly and scared the cheetah away. What morons! Another day, nevertheless, in an environment we love. 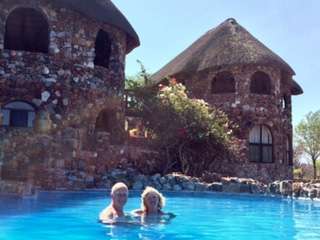 Even thought he heat is oppressive in the park, we can at least return to our lodge for refreshment and meals and a welcome dip in the pool between rounds. 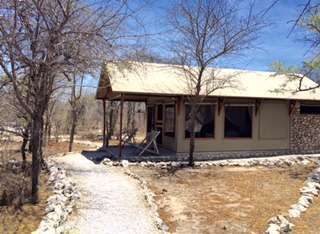 For once, a civilised start and departure from Mushara Bush Lodge at 8.30am. Also new to us was a long stretch of metaled road that lead us towards Otjiwarongo. 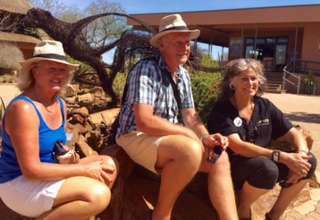 We made good progress, somewhat fazed by the presence of other vehicles and traffic signs until we turned off the road towards the Waterberg Mountain plateau and the Cheetah Conservation Fund base. Once again we were on a sand and gravel surface and our pace slowed accordingly until some 45kms later we reached CCF. Our visit coincided with a presentation from the Turkish Government to CCF of a new research vehicle, on the back of a clever initiative to introduce Anatolian Mountain, or Shepherd, dogs as a breed to counteract predator activity against local farmers’ livestock. By donating these dogs to farmers their presence deters leopards and cheetah from snatching sheep and goats without which the farmers would shoot the cats. 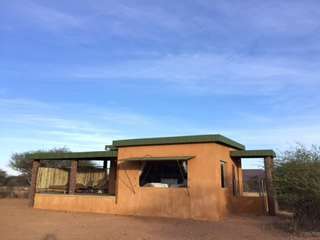 After meeting Laurie Marker (the Fund’s founder) and a presentation and tour guided by her staff we moved on to Africat, a complementary Foundation engaged in similar work and where we were to stay for the next two nights. The valuable work of these two initiatives will feature in a future blog of ours. Incorrectly assuming that we’d seen the last of the black bin liners that we used to cover all of our baggage, which regularly acquired a thick layer of fine dust in the back of the Ranger (the only complaint we had of the vehicle in all our travelling) we again departed the metaled road surface and drove for another 20kms along rutted and lose surfaced gravel and sand towards Okonjima. Whereas CCF is more research based, Africat revolves more around income from tourism and they have embraced the notion wholeheartedly with four unique facilities from which to choose. 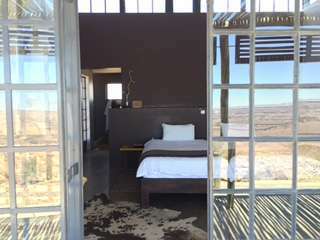 We based ourselves at Okonjima Plains Camp – a more modern reflection of the original farm’s origins with a central facility which looks like a converted industrial unit but cleverly treated with a great deal of stainless steel in a retro/Steam Punk style that works extremely well. The individual villas of the camp are also very modern with great attention to detail. 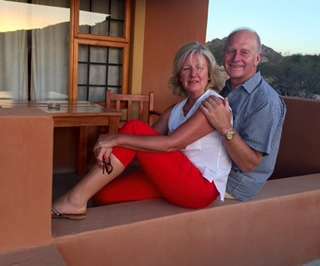 We were happy just to settle in for the evening with a large G&T and excellent food served as we looked out on the magnificent night sky with animals at the waterhole in front. A 5.30am wake-up call is becoming commonplace now, especially as we want to enjoy every opportunity to see wildlife as our journey comes to an end. With our guide, Gideon, who is head guide at Okonjima, we set out in their safari vehicle to track leopard. Africat have fifteen radio collared leopards that live wild in the 20,000 hectare estate that spans an area roughly 20kms x 24kms square – a huge range that enables animals to establish their own territories and hunt freely whilst under the protection of wildlife minded people. We spent the whole morning following the faint ‘beep, beep’ of the radio collar before finally coming across ‘Jo-jo’ the leopardess, resting in the shade of a termite mound. Whilst she is habituated to the presence of humans she doesn’t make it easy and despite maneuvering the vehicle through some thick thorn bush we were only afforded a fleeting glance of this beautiful animal before she moved away. 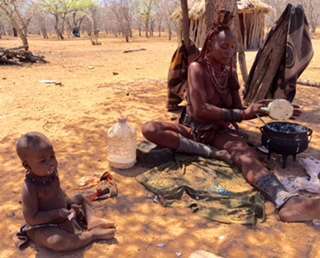 Returning for a hearty breakfast – for one of the most enormous ‘with everything’ omelettes we’ve ever seen – we then toured the remaining facilities of Okonjima including their Bush Camp (which is much more traditional Africa with its Adobe and wood construction. 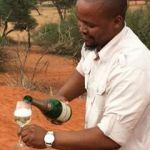 The more exclusive Bush Suite and lastly the ‘Villa’ , which is within the main reserve are suited for families and small groups who really want to get away from it all but still enjoy the attentions of their own chef. This afternoon is dedicated to tracking cheetah, seven of which are in the reserve, although we’ve learnt of the death of one at the hands of leopard today. Again, some are radio collared which permits tracking and location and after a steady drive of an hour we leave the safari vehicle and proceed on foot with a guide both in front and behind us. 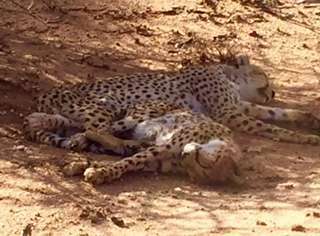 After a half an hour of walking through and around thorn bushes and aardvark holes the signal intensifies and we spot three cheetah laying in the shade. We’re lucky, for had they been ready to hunt we would have had our work cut out to keep pace with them. As it is we sit about ten metres away from them and simply watch as they gradually rouse themselves from sleep. Our way back to camp is enhanced by a lucky sighting of four wild, or painted, dog who are similarly preparing to hunt and to see one dog trying to rouse the others from slumber was a delight. A final sun-downer halt as night fell with views across this huge reserve and we regretfully headed back for yet another sumptuous dinner and sadly, our last night in Namibia. With only a plan to stop at a wood carving market on the outskirts of Okahanja en route to Windhoek, our departure from Okonjima was relaxed. Back onto metaled roads again and the journey was a cruise, with the exception of a very disconcerting incident. We’d become accustomed to seeing few, if any vehicles on the roads and although the Windhoek road probably had more cars on it than we’d seen in all of the three weeks put together it was by no means busy. 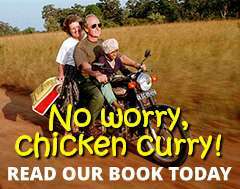 Imagine our surprise,as we crested a rise, at seeing a cluster of flashing blue lights in the distance heading our way on a narrow two-way tarmac road, travelling at speed. As they neared, the lead police car moved to the centre of the road and forced Cherrie, who was driving, to move towards the verge. It was at this stage that we realised that the remaining eight or nine police cars were straddling both sides of the road and leaving no room for us. I asked Cherrie to quickly get us onto the gravel verge and as she did so the group of vehicles raced past us on both sides of the road. Looking behind us we could see the double column of cars crest the very rise we’d just come over – heaven help anyone on the other side. Whilst we’re used to tin-pot convoys of ‘dignitaries’ and their outriders hogging the road in India from time to time, they do so at sensible speeds amidst great fanfare. This was the first time we’ve seen the like, without any apparent dignitary on board, at speeds that were life threatening to other road users. Complete madness; to have survived three weeks of rough road driving and isolation to confront a threat on practically the only stretch of proper road we’d come across. It never pays to relax. Feeling a bit rattled by this experience we made a short stop at the woodcraft market but weren’t really itn he mood for endless haggling with the hundred or so stall holders, all of whom wanted us to visit their wares. We settled on ‘Mama’s shop’ and after some lighthearted banter purchased a couple of gifts for our kids and a Namibian ceremonial mask for our growing collection at home. The remaining journey to Windhoek airport seemed a doddle by comparison. We dropped the 4×4 off at Europcar and other than a few kilos of dust brought it back as we had collected it. We were a little perplexed by the mechanics’s suggestion that the gearbox was ‘loose’ as its one of the worst we’ve used. After suggesting that when we collected it the oil was cold and now after 300kms it was thin and free he eventually relented – but we’ve yet to receive our deposit back! It’s a shame this happened as otherwise we’ve nothing but praise for the company and the car. We’ll follow this day-by-day account with posts of various aspects of the journey – so please keep watching and reading!